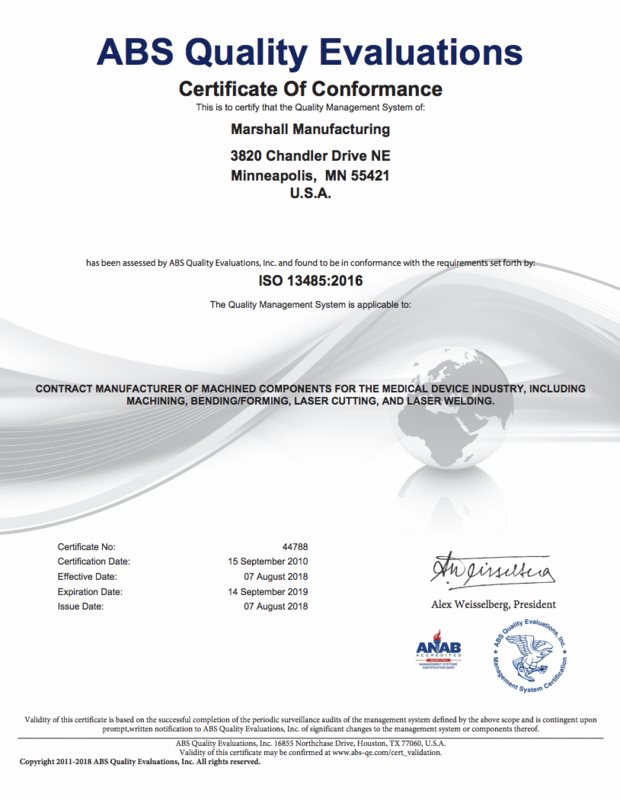 ISO 13485 registered, Marshall provides their customers documented quality components and assemblies. Their highly trained personnel utilize state-of-the-art calibrated measuring equipment, ranging from vision systems, stereo microscopes and other measuring equipment. From top management through our inspection department all the way to our manufacturing personnel on the plant floor, everyone at Marshall understands the importance of quality. We are committed to producing defect-free components. Marshall assures traceability of our customers product by certifying material, machines, gauges, inspection equipment and processes. Marshall is fully qualified to manufacture our customers’ medical components and assemblies. Registered to ISO 13485: 2016, Marshall’s quality system is effectively implemented and maintained. Prior to accepting a new contract for a component or assembly, a risk analysis is conducted to be certain all criteria can be met. Process verification and validation are implemented to ensure production processes are capable and repeatable.